DUMBARTON secured their third 2-2 draw in successive Ladbrokes Championship matches with a fine performance in front of a 4,160 crowd at the Falkirk Stadium. The previous draws with strugglers Ayr United and St Mirren were disappointing, but this was a thoroughly well earned point against a team challenging for second spot in the division. There were chances for both teams in a competitive first half, but the Bairns struck first on 36 minutes, when Luke Leahy opened the scoring with a looped effort over Alan Martin. Two minutes later, Sons had drawn level. 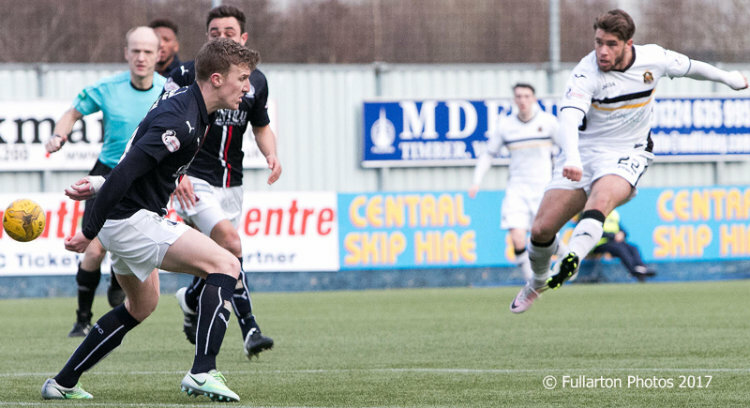 Lewis Vaughan fired a cracker into the top corner of the Falkirk net, starting from an even tighter angle than Leahy had moments earlier. It was not long after the break that Dumbarton edged in front. Christian Nade tracked back to set up Andy Stirling, who left his defender standing before making it 2-1 from 20 yards out (pictured). The hosts were looking for a quick response. They found one just on the hour when the ball broke to Nathan Austin, who could not miss from close range. Sons came close to snatching the match several times in the closing half hour, including a Daniel Harvie header off the bar. Falkirk's James Craigen also hit the woodwork, and the Bairns had the ball in the net themselves, but from a clearly offside position.